Research - regardless of the area of research - always aims to identify solutions that point the way to the future. In December 2011, it was the Cross Coupé - a concept vehicle from Volkswagen - which with a fuel consumption value of just 2.7 l/100 km (equivalent to 62 g/km CO2) illustrated a technical approach to implementing an SUV that can be extremely fuel-efficient despite its high performance and all-wheel drive system. This plug-in hybrid concept was driven by two electric motors and a turbocharged petrol direct-injection engine (TSI). Now, Volkswagen has conceptualised an even more fuel-efficient Cross Coupé. It is powered by an alliance of a turbodiesel direct-injection engine (TDI) and two electric motors. Its combined fuel consumption in the New European Driving Cycle (NEDC) is a sensationally low of 1.8 l/100 km. This is equivalent to CO2 emissions of just 46 g/km. Noteworthy here is the fact that the Cross Coupé is a powerful SUV with a top speed of 220 km/h, 225 kW / 306 PS of power (system power) and a kerb weight of 1,858 kg. Volkswagen is presenting the concept with a TDI plug-in hybrid in a world premiere at the Geneva International Motor Show (08 to 18 March 2012). Within the MQB, there are certain design parameters that are standardised across model series and brands - such as the distance between the accelerator pedal and the front wheel axis and the mounting position for all engines. There are also variable parameters that make it possible to optimally and individually develop a wide variety of models. They include such parameters as the wheelbase, track widths and wheel sizes, for example. In the new Cross Coupé, MQB elements for a future generation of SUVs - in this case, the MQB front and rear suspensions, 140 kW / 190 PS TDI of the new EA288 engine series and a 6-speed DSG. They were merged with electrical components that are also "made by Volkswagen", and they include the lithium-ion battery in the centre tunnel, front E-motor with 40 kW and rear E-motor with 85 kW. Efficiency and dynamic performance. Efficient drive technologies can offer extreme levels of dynamic performance. The new Cross Coupé demonstrates this par excellence. Its combination of cutting-edge fuel efficiency and exceptional dynamic performance demonstrate that an all-round vehicle of a sporty kind has been created here like never before. The Cross Coupé being shown in Geneva accelerates to 100 km/h in just 6.5 seconds, and its TDI develops a torque of up to 400 Nm from very low revs - from approx. 1,600 rpm. Practically at the press of a button, the two E-motors deliver 180 Nm of torque in front and 270 Nm at the rear. During boosting - which involves full use of both motors and the engine - the drive system supplies a maximum system torque of 700 Nm. This performance positions the concept car in the field of today's high-performance sports cars, yet the vehicle consumes less fuel than any other small car! Zero emissions thanks to electric motors. In pure electric mode - in this case its speed is limited to 120 km/h -, the concept car can cover up to 45 km. This is sufficient driving range for most of the world's commuters to drive to work with zero emissions. In pure E-mode, the driver can choose whether the focus should be on optimising electric driving range or dynamic performance. This is implemented by the combination of E-mode and CITY mode and the combination of E-mode and SPORT mode. In the electric driving range maximising E-mode (CITY), only the E-motor on the rear axle powers the car. In the dynamic E-mode (SPORT), the electric drive system powers both the rear and front wheels. In pure electric driving, the turbodiesel is decoupled from the drivetrain by disengaging the clutch, and it is shut off. The clutch on the gearbox side remains closed, and the 6-speed DSG is engaged. The E mode is activated by pressing what is knowna s the EV mode button (EV: electric vehicle) next to the gear shift lever. The Cross Coupé then drives like a purely electric vehicle. Even during fast driving, the internal combustion engine is not engaged, provided that the battery is sufficiently charged. As soon as the power of the TDI is needed again, either because of the battery's charge state or other parameters, the engine engages without any jolt, and it is once again actively coupled to the drivetrain within fractions of a second. Charging also at push of a button. The driver can intentionally switch to CHARGE mode (by pressing another button next to the gear shift lever) to charge the battery via the TDI engine while driving. This mode might make sense, for example, if the driver wishes to drive in certain designated environmental zones that might be toll-free for electric vehicles operating with zero emissions. The momentary electric driving range and total range of the Cross Coupé are continually displayed in the instruments. Zero emissions by 'sailing'. As soon as the driver lifts his or her foot from the accelerator, both electric motors and the engine are shut off and decoupled from the drivetrain - provided that the battery is sufficiently charged. This is referred to as 'sailing'. Zero emissions are generated in this case as well. Boosting. When driving should be especially sporty in nature, the E-motors form an alliance with the TDI. In the professional jargon of the hybrid world this joining of forces is known as 'Boosting'. The Cross Coupé is driven by all four wheels in this mode. Offroad with 'electric propshaft'. As soon as the driver chooses to activate OFFROAD mode, all four wheels are once again driven. However, in this mode the front electric motor, now supplied with energy by the TDI, is the sole source of electrical power for its counterpart at the rear axle. Since the energy for the rear electric drive is by wire and does not flow mechanically, this is referred to as an 'electric propshaft'. 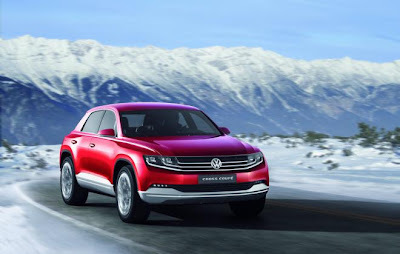 Since the TDI powers the rear electric motor via the front electric motor in OFFROAD mode, the all-wheel drive system is fully functional, even if the lithium-ion battery is in a low charge state. Driving with the TDI. If the TDI is powering the vehicle by itself, the Cross Coupé is a pure front-wheel drive vehicle. In driving states in which greater fuel efficiency is possible by load boosting, the E-motors act as generators to charge the battery. When all of the on-board energy reserves are utilised, the vehicle's combined fuel consumption value is 1.8 l/100 km; the vehicle's 55 litre fuel tank thus enables a theoretical driving range of 1,287 km. Engines of the MQB. As noted, the TDI of the Cross Coupé is an engine developed especially for use in the Modular Transverse Matrix (MQB). A key characteristic of the MQB is a uniform mounting position for all engines. Therefore, Volkswagen developed two new engine series - the EA288 series was created for the diesels, and the EA211 series for the new petrol engines. Within the MQB, these two engine series and relevant electric motors make it possible to implement any classic, alternative or hybrid drive system. Range of turbodiesels. The new TDI engines of the MQB will be available in versions with 1.6 and 2.0 litre displacement and will span a power range from 66 kW / 90 PS to the 140 kW / 190 PS of the concept car in Geneva. The diesel engines are not only exceptionally low-emitting, fuel-efficient and torque-strong. They are also exceptionally refined and smooth running. Consider the 2.0 TDI of the Cross Coupé: two balancer shafts are used. They eliminate system-induced free inertial forces that naturally occur in a reciprocating engine. Meanwhile, the toothed belt drive for the oil and vacuum pump, which operates in the sump oil, and the engine's encapsulated injection nozzles also have a positive effect on acoustic comfort. More streamlined than other SUVs. At a length of 4,357 mm, the Cross Coupé is longer than a Golf and shorter than a Tiguan. The vehicle's width (1,868 mm) and height (1,523 mm) are positioned exactly between these two bestsellers as well. The concept vehicle's wheelbase of 2,630 mm is clearly long relative to its overall length (52 mm longer than in the Golf, 26 mm more than the Tiguan). This makes the body overhangs short (855 mm in front, 860 mm at rear), and in the interplay of all dimensions the car's overall proportions are extremely attractive. The vehicle's large track widths of 1,585 mm (front) and 1,613 mm (rear) emphasise its powerful appearance. More important to driving on unpaved trails are parameters such as the vehicle's approach/departure angles and its ramp angle. The approach angle in front is a good 24.2 degrees, while the departure angle at the rear is 32.5 degrees - excellent for offroad driving. The ramp angle, which is important for driving over hilltops, is 15 degrees. Precisely shaped coupé silhouette. Defining the look of the Cross Coupé are its very long bonnet, new front end styling, passenger compartment shifted significantly towards the rear, and very streamline line of windows compared to conventional SUVs. Overall, the designers also gave the vehicle muscular, athletic and yet very clean lines. In keeping with the powerful appearance of the Cross Coupé, it is equipped with 20-inch alloy wheels fitted with 265/45 tyres. Towards the rear, a large-volume coupé-like C-pillar is built over the wheel housings. Impressive front end. The characteristic horizontal lines of the 'Volkswagen face' forge a link between present and future on the Cross Coupé. Different than on today's models, the designers have physically merged the xenon dual headlights and chrome ribs of the radiator grille. Specifically, the headlights join to two overlapping chrome strips. Chrome wings ascending towards the outside emphasise the vehicle's width and are part of a new type of lighting concept; the lower of the two chrome wings contains the daytime running light, while the upper wing houses the direction indicators. The LED fog lights are mounted in the bottom section of the bumper. Rear of a SUV coupé. The rear is also typified by a streamlined line of side windows. Typical of a coupé is the rear window that is worked in at a low angle. At its top, the boot lid terminates in a spoiler, which visually extends the roof surface and technically optimises aerodynamics as a trailing edge. The rear lights have a narrow profile. Typical of an SUV, meanwhile, is the brawny rear bumper, in which dual tailpipes are integrated to the outer left and right. The best of two worlds. The SUV and coupé worlds form an exciting alliance in the Cross Coupé. In the four-seat interior, this has resulted in all design details being much sportier than in conventional SUVs. Consider the instruments: they have the dynamically precise lines of a coupé, but they are positioned up high as in an SUV. The surfaces of the instruments are very sophisticated in their construction, but they are designed to be very rugged. This ruggedness is also reflected in user controls, handles and the general feel of interior elements. Take the centre console, for example: two aluminium dials make control of powertrain and climate functions quick and easy. Located between these two dials is the button for the electronic parking brake, and in front of it are the gear shift grip of the 6-speed DSG, also in aluminium. Integrated in front of this, in turn, is the start button for the drive system. To the right and left of the gear shift lever, there are sturdy yet elegant grab handles and, on the right side, the selection buttons for pure electric driving and active battery charging. Further up, there is a touchscreen display, on which onroad and offroad navigation and all relevant vehicle features up to and including the audio system are shown. Programmable instruments. Arranged behind the three-spoke steering wheel is a user-programmable instrument cluster display. A control wheel to the left of the gear shift lever can be used to dynamically change the display contents between the modes 'SPORT', 'CITY' and 'OFFROAD'. The functionally different display mode contents are activated based on this selection - a gyrometer, compass and topographic map are shown in OFFROAD mode, for example. All three modes have unique layouts, and they also have different colour schemes. Centrally positioned between the two round instruments is another multifunction colour display for showing vehicle information, the telephone menu, audio information and other navigation data as well as a 3D offroad view. Ergonomics for long trips. The Cross Coupé is equipped with four individual seats, each designed as a shell with a permanently integrated head restraint. These seats exhibit very balanced ergonomic properties. There is ample room for all four occupants - to their sides, in front of them and above them. The backrests of the rear seats and front passenger's seat can be folded forward completely to load surfboards, paragliders or other bulky equipment in the Cross Coupé. Helpful here: the backrests have exterior plastic shells; folding them produces a durable cargo surface. The boot behind the rear seats has a volume of 380 litres (up to the height of the window sill). When the interior is filled to the backs of the front seats and all the way to the roofliner, cargo capacity increases to 1,230 litres - a lot of space for a car that only consumes 1.8 l/100 km! Four individual seats (2/2); folding rear bench and front passenger seat; cargo capacity: 380 to 1,230 litres.